Our accordion style corrugated boots are designed to be in conjunction with gyratory and vibratory equipment. 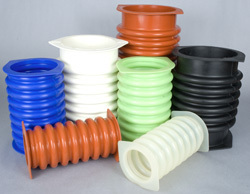 They are molded in a variety of high quality compounds to suit your specific application requirements. We have included a chemical resistance chart to assist you in choosing the compound that best fits your needs. Style “B” boots are 12” long. They are molded in 6” & 8” diameters. They are designed to fits over a straight pipe or flange. They are most often attached with hose clamps. This style is commonly used on circular vibratory separators. Silicone does well in applications with higher temperatures, weather, oxidation & ozone.